Every year, the holiday season seems to get busier and busier. Your to-do list is long, with so many commitments and chores to finish, and let's not even mention the hassle of shopping. In the end, all you really want to do is sit around a glowing tree with family and friends, enjoying the coziness and peace of your home. So try something different this year and host a Tree Trimming Appetizer Party! A tree trimming party is a great idea for completing one chore, celebrating the season, and easily entertaining a crowd of friends. Invitations can be sent out ahead of time, or you can make this a spur of the moment gathering. All you need is a tree, decorations, willing friends and appetizers to serve buffet style. To make holiday memories even better, ask each guest to bring an ornament to add to your tree. In years to come, when you unpack these ornaments, you’ll remember this wonderful gathering and the special people who add so much to your life. When you plan a party around an activity, serving appetizers that people can just grab and munch is an excellent way to feed a crowd. Be sure to consider variety when you plan your menu. Choose an assortment of hot and cold appetizers, some crunchy and some creamy. Healthy choices are always appreciated, including vegetarian foods. Keep food safety and serving temperatures in mind too. No food should be left at room temperature for more than two hours. Keeping hot appetizers hot is easy if you use chafing or fondue dishes, slow cookers, or heating trays. Replenish cold foods that have been sitting out for two hours with fresh foods from your fridge. With a movable party like this one, having several tables set up for your food will help avoid congestion and create a nice traffic flow. If you are having lots of people over, it's also a nice touch to label each appetizer, so your guests can pick and choose according to their tastes and dietary needs. So call up some friends, throw on holiday tunes, set up your tree, and relax. With this party, you're guaranteed a wonderful time. Choose from the following list of appetizers I think would make a wonderful selection, or choose your own from the Busy Cooks Appetizers Recipe Box. And serve some Christmas cookies for dessert, of course! This little three ingredient recipe is simply fabulous. You could use other types of cheese such as Camembert or a flavored goat cheese in place of the Brie if you'd like. You can make the little tart shells ahead of time, then fill and bake them just before your party. This rich dip keeps nice and hot in your crockpot. I like to serve it with baby carrots, celery sticks, bell pepper strips, and cauliflower florets. This beautiful dip looks just like Christmas! Garnish it with some rosemary sprigs and serve with toasted thin slices of French bread. This beautiful dip is perfect served with pirouette or sugar cookies, along with apple and pear wedges. These cute little breadsticks are so fun and easy to make. They're perfect dippers and great for just munching. 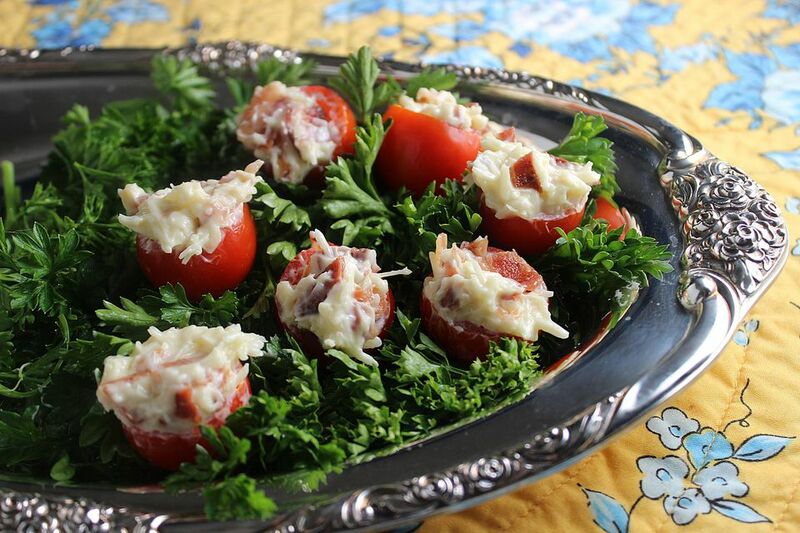 This is such a fun appetizer to make, serve, and eat! Make the muffins ahead of time. Another delicious dip with Christmas colors! Set out the usual dippers along with some pretty appetizer knives. Set out bowls of this delicious sweet snack around the room for munching as the party progresses. This refreshing beverage has a kick of fresh mint and the tingle of orange juice and lemonade. Remember, tree trimming is thirsty work - have a lot of pop and sparkling water in a tub on ice.